Christmas is approaching and it is time to start planning your much awaited annual festive event to celebrate in style with your colleagues and friends. Allow us to offer you our support in planning and coordinating your special event at db Hotels + Resorts, whether it is at the db Seabank Resort + spa in Mellieha, or at db san Antonio Hotel + Spa in Qawra, whereby we specialise in All - Inclusive Buffets or standing Up Receptions in both properties. Should you be interested in making a booking, we would highly recommend an early confirmation in order to avoid disappointment. 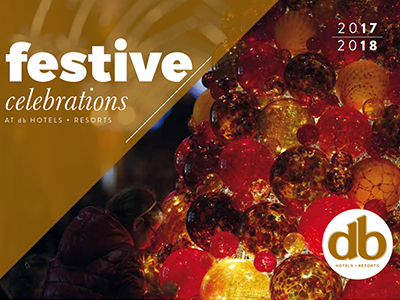 This Christmas you can put your mind at rest of our commitment to ensure your event will be a great success. We are also offering special overnight rates to large groups wishing to make sure the function is enjoyed safely and to the full.